Salt, sugar, monosodium glutamate, corn starch, beef fat, hydrolyzed corn protein, dehydrated chicken meat, yeast extract (barley), chicken fat, natural flavors, maltodextrin, silicon dioxide (prevents caking), dehydrated parsley, disodium inosinate, citric acid, yellow 5, annatto (color), yellow 6. Liven up your menu with full‐bodied, Latino flavor! 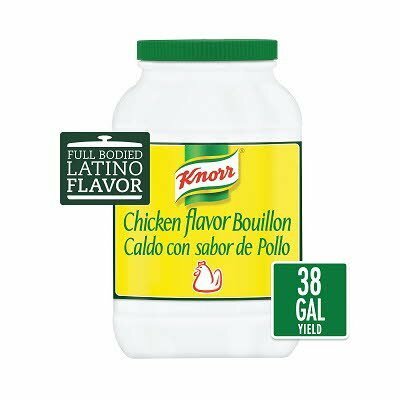 Developed specially for catering services, restaurants, and other busy culinary environments, Knorr Caldo de Pollo Chicken Bouillon is a Hispanic favorite that delivers flavor and efficiency chefs can trust. This delicious chicken broth base is made from a blend of chicken, onion, parsley, and spices, and it offers a distinctive and vibrant flavor that is ideal for use in traditional Latino recipes, like enchiladas, arroz con pollo, and chipotle chicken. It prepares quickly; simply add it to boiling water to create a delectable broth or soup stock. Packaged in a bulk-sized resealable container, this chicken broth and stock concentrate is perfect for busy kitchens where efficiency is a must. It is shelf-stable and can be stored for long durations while still retaining its flavor. To prepare a delicious chicken broth, simply dissolve 5 oz Knorr Caldo de Pollo with 6 qts of boiling water to yield 96 ounces of chicken broth. Use also as a base in preparing soups, moles, sauces, rice, pasta, casseroles and vegetable dishes.